Rupert Pupkin Speaks: Favorite Underrated Dramas - Paul Corupe ""
Paul Corupe is a longtime, dare I say 'veteran', contributor here. He writes for RUE MORGUE magazine, Fantasia Festival's official webzine SPECTACULAR OPTICAL and his own spectacular site, CANUXPLOITATION. All his writing is recommended reading. He is a man of many varied likes as far as film goes. He has turned me onto many fine and less than fine films all of which have brought me great enjoyment. Let him do the same for you with this round of underrated dramas! Based on a short story by John Cheever (rather coincidentally one of my favourite authors), this offbeat piece of 1960s suburban surrealism stars Burt Lancaster as Ned Merrill, a wealthy business exec who one day decides to return home from a nearby friend's place by swimming a "river" of his neighbours' backyard swimming pools. Along the way, he stops for smalltalk with those he encounters, leading to a rich exploration of his character and past in a fascinating, episodic style. Director Frank Perry ably captures the way the picturesque splendor of Ned's privliged, high society is just an empty glossiness, as the pieces of Ned's mysterious past begin to fall into place through his conversations with his increasingly annoyed and hostile neighbours. 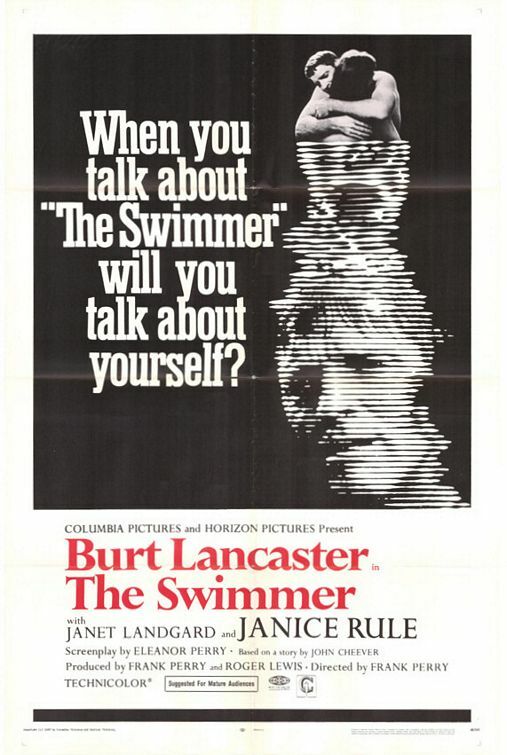 I'd hesitate to place this above Cheever's story, but it's quite close--a beautifully sad film in which the viewer must piece together whether this is a true search for authenticity, an encapsulation of a broken life, or simply a run-of-the-mill mental breakdown. Grindhouse Releasing has anounced they are working on a Blu-ray of the film, which will surely help to nudge the film's profile alongside undisputed '60s classics like The Graduate and Midnight Cowboy. Up here in the vast frozen wasteland of Canada, almost every film we make could be considered an underrated drama, but Zale Dalen's 1977 tragedy Skip Tracer is certainly one of the best Canadian films to still be searching for its audience. 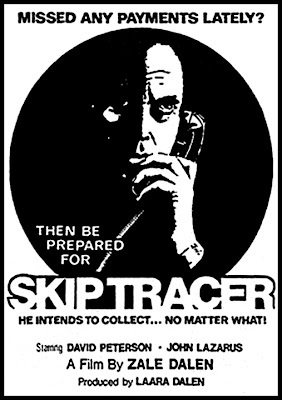 Shot in the mean streets of Vancouver, this poignant tale follows John (Mark Archeson) an officer for loan sharking outfit who tracks down people who are delinquent on their repayments. Once the top man in the office but fallen on hard times, John attempts to claw his way back to success by closing all his outstanding accounts, often using intimidation and violence. But while unsuccessfully chasing down a particularly slippery skip, John experiences an existential crisis in which he realizes the true extent of his actions on those caught in the loan company's exploitive practices. Released on VHS as Deadly Business in the U.K. and only rarely shown on Canadian TV, the film is one of the most fascinating and distinctive Canadian works of its era, a film that combines gritty 1970s location shooting in Western Canada's dingiest back allies with a pathos-drenched story that often feels like a dry run films like Repo Man and Glengarry Glen Ross. Roger Corman was once an idealistic young man, before he realized there wasn't really any money in it. Though the later "King of the Bs" really only highlights his most personal film, The Intruder, as an example of his business sense failing him, it's disingenious to simply brush aside the quality of this notable work and its explosive dramatics. William Shatner has one of his best performances in this Civil Rights-era potboiler as Adam Cramer, a mysterious figure who arrives to a small town south of the Mason-Dixon to re-stoke the flames of racism. Giving a series of fiery speeches on the eve of black-white integration at a local public school, Cramer soon finds he can't control the mob he has created. Corman frequently used allegory to make poignant social commentary in his genre films, but here he's in full moral message mode and the results are surprisingly engaging--the film explores the way repugnant ideas can become a powerful force for evil in a way that can be difficult to anticipate. Overlooked by Corman die-hards as the black sheep of his filmography (in that it doesn't contain blood crazed beatniks, killer crustaceans or switchblade-toting biker gangs), thrill-seeking viewers may be surprised at the production's bouts of raw violence. But this is really Shatner's show, as the charming, well-dressed stranger of the opening scene is gradually revealed to be a hatemonger, a bigot, and then a true sociopath in what amounts to the film's most stunning achievement. 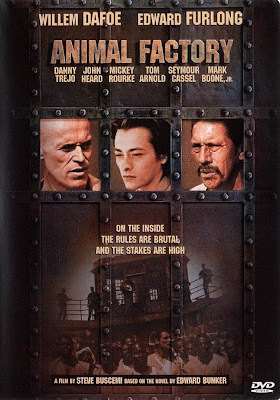 Steve Buscemi adapted ex-con Edward Bunker's classic story of life behind bars for this unjustly passed over prison tale. An impressive cast, including Seymour Cassel, Mickey Rourke (as a drag queen! ), Danny Trejo, John Heard, and even Bunker himself, the story concerns the fatherly relationship between lifer Earl (Willem Dafoe) and Ron (Edward Furlong), who is sent up on a pot posession charge. As the other prisoners plot and scheme about how they might use and abuse the young Ron, Earl steps in as a mentor and friend to help him navigate this dangerous new world--even if his motives aren't entirely clear or, for that matter, trusted. Animal Factory is a seemingly realistic portrayal of prison life and the high stakes power struggles that define day-to-day existence in a stifiling atmosphere where concealing weakness is more important than where you hide your shiv. 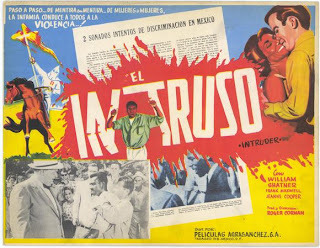 Featuring real convicts and locations, and some amazing procedural sequences of what happens when administrators look the other way, there's a grim realism on display that is occasionally overshadowed by the complex relationships between Earl, his new friend and the violent gangs that make up the rest of the population. OK, technically you could Arch Oboler's post-apocalyptic tale Five a science fiction film rather than a drama. But while it's true that the film follows the story of the last five survivors of a nuclear war, there's no sign of mutants, weaponized trucks or even Fred Williamson in a shiny headband. Instead, Five is a lonely, heavily allegorical story about the personal relationships between four of those humans that remain, and how the surrogate society they create is threatened by a later arrival--an angry, self-destructive interloper who threatens the last hope for civilization--including the new baby of one of the survivors. Shot on the cheap in Oboler's backyard by a crew of enterprising film students, the film features stark black and white cinematography that approximates what happens if a French New Wave film got lost in the blistering sands of an American desert wasteland and started hallucinating. It's a thoughful, quiet film that makes On The Beach look like an overstuffed Hollywood epic by comparison, only pausing for some exploitation thrills once a few of the characters head into the city to see the extent of the devastation. 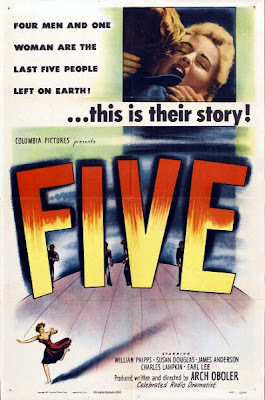 Best known for offbeat works like The Twonky, Bwana Devil (which was first to bring 3-D to the local movie palaces) Five may be Arch Oboler's most accomplished film, a tragic tale of devastation with an appeal that extends far beyond the realm of only genre fans. Good calls on THE SWIMMER and FIVE. I rarely see the latter turn up these days. Frank Perry's PLAY IT AS IT LAYS is also very underrated, and like THE SWIMMER, can also be seen as witnessing a mental breakdown.